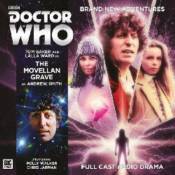 When an archaeological dig in 1980s England finds a Movellan power pack buried amongst Iron Age artefacts, the Doctor and Romana have no choice but to investigate. And what they discover worries them very much indeed. A Movellan ship is buried under the ground. Soon the robotic enemies of the Daleks are making their way to the surface, but they are not the biggest threat humanity faces. Because on board this ship is the greatest weapon the Movellans have ever devised. A weapon that could stop the Daleks forever...and anything else that gets in their way. This is the sixth series in a Big Finish range which is hugely popular with fans young and old of the classic TV series Doctor Who. The pairing of the Doctor (Tom Baker) and companion Romana (Lalla Ward) harks back to the most-watched period of Doctor Who, one that to a generation is the most loved and iconic and which broke the records for viewers of the show. This story features the Movellans - android foes of the Daleks - for the first ever time in 19 years of Big Finish productions. CAST: Tom Baker (The Doctor), Lalla Ward (Romana), Polly Walker (Narina), Chris Jarman (Chenek), John Banks (Robin Lyon), Jane Slavin (Mary).